These Halloween Party Decorations will be super spooky and fun to make! First things first – do NOT eat the trees! There is a wire in them. (Gulp!) Everything else is edible. 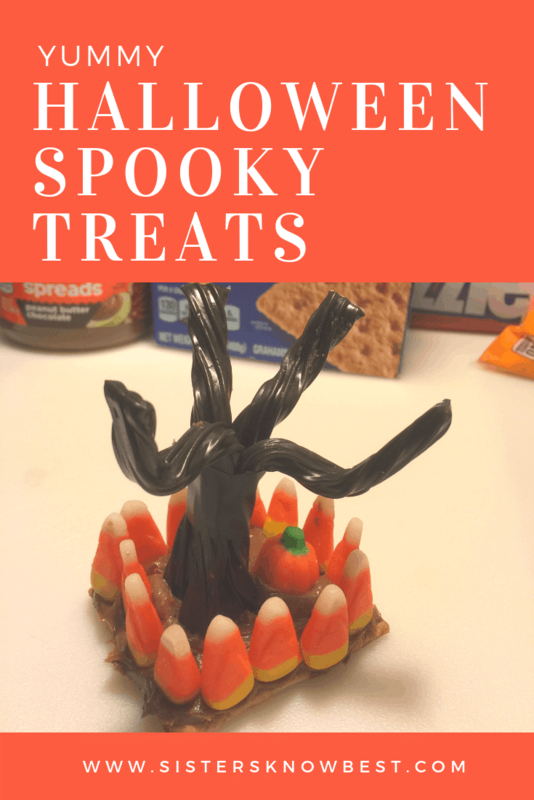 These are yummy and adorable Halloween centerpieces! The original post says they are not edible; however, it’s because of the black wire they used. Instead of black wire, I twisted my trees together and then used black electrical tape to tie it together. 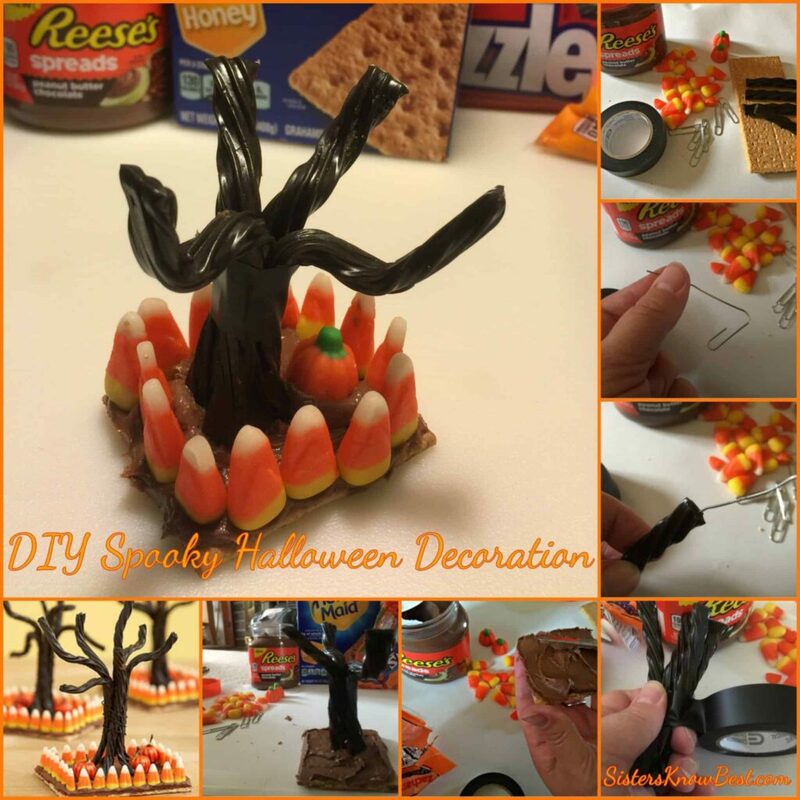 Even though this project is Halloween themed, why couldn’t you make an Easter tree centerpiece or a Christmas tree centerpiece. You’d need only to substitute the candy corn for something festive to each occasion and use a different colored frosting of some sort. I’m liking this idea! What are other centerpiece ideas? Please do share! Cut 2- 3 black licorice in half for each treat. Straighten out paper clips and thread through each piece of licorice. Group together 4-6 pieces of the licorice and fasten with black electrical tape or black wire. Bend the licorice in to gnarly scary branches. Spread Reeses or Nutella spread on half a graham cracker. Place the tree in the middle of the graham cracker. Line the edge of the covered graham cracker with candy corners to form a fence. Place a candy pumpkin or two next to the tree. These spooky Halloween decorations are fun and quick to make but look like they took awhile. Also, they’re easy enough to have the whole family take part in the creating. 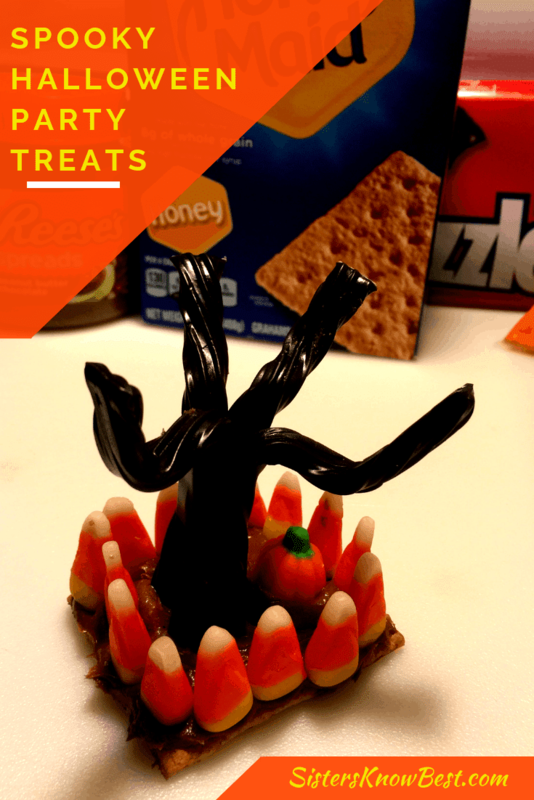 Grab the kiddos and the adults in your family and make a spooky forest! Don’t forget not to eat the licorice but everything else is yummy and edible. What are your plans for decorating this Halloween? Share with us here or on Facebook!